However, today, the original store is threatened with demolition unless people come forward to stop it. The distance between cordwood dealer and tea merchant seems enormous, but not for resourceful people like the Darlings. Upon arriving in Canada with his wife, Janet (Findlay) Darling, Thomas saw a gap in the marketplace. Steamboats travelling the St. Lawrence River needed fuel to bring trade goods back and forth. Local residents had cordwood but no convenient outlet for their product. In very little time, the Darlings had a thriving cordwood business. But Thomas was always looking ahead. He realized that it took more than firewood to keep people going. They needed lamps and oil, shoes and clothing, all manner of food, dry goods and supplies. Recognizing these needs, he opened a general store in 1845. Strategically located on the river, it served the local populace as well as the steamers. Although much of the business was conducted by barter, he did very well indeed. “Thomas Darling was the only tea merchant for a long time, but when the roads and railroads opened up, he opened a store in Lansdowne,” says Linda Davis, proprietor of The Art of Tea. In 1851, he began acquiring the properties which, when annexed, became Darlingside. Thomas and Janet eventually had ten children, two of whom died very young. Of the surviving eight, most were well educated. Most of the family was heavily involved in many aspects of community life, with sons George and J. D. W. Darling becoming tea merchants. By 1896, there were three tea merchants in Lansdowne. J. D. W. went on to become Township clerk in the 1880s, Justice of the Peace in the early 1900s, and ran an insurance company in addition to his business selling tea. Both Thomas and his son, Thomas J. Darling, served as reeves of Lansdowne Township in addition to the other family businesses. The business developed as Darling’s Fragrant Tea sold products from Highway 7 to the Islands, Napanee to Chesterville to Quebec north of Ottawa. Tea was sold in tins and peddled door to door, delivered by horse and wagon. Business was so good trade even extended to places as far away as Alexandria Bay, New York. Reading through the documents and looking carefully at the ledger, receipt book, tins and other artifacts remaining from this business, one begins to get a sense of the importance of tea in the region over the past two centuries. Other sources indicate that in 1861, tea was responsible for a full 7 per cent of all sales at Darlingside General Store. Selling at $0.40 a pound for green tea and $0.50 a pound for black, orders in excess of 10 pounds each appear to have been the rule, not the exception. And storage of such large amounts was no problem. Tins could be rented for between $0.30 and $0.50 a year to keep the tea dry, clean, and safe from rodents. Careful records were kept, with all payments duly noted. For those who fell behind, gracious letters of “reminder” were sent, ensuring that everything stayed on the up and up. Even in the last two centuries, variety was the spice of life and much appreciated in the tea industry. Amongst the teas we no longer see, the Darlings carried Hillcrest, Bakarah, Kalwella, Goloonga, Noland, Topaz, Richelieu, Key Branch and Blue. Teas from India and Japan were in high demand, and the business eventually moved into the wholesale market, delivering all over with the help of the latest in shipping technology: the trains. Among the preserved documents is a hand written set of instructions for brewing the perfect cup of tea. 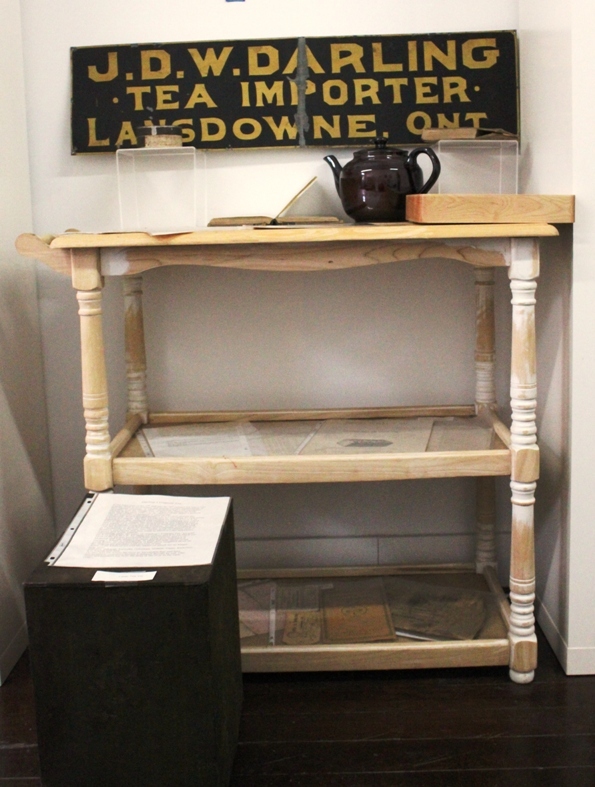 Although the original business and the Darling tea merchants are no longer with us, the Leeds and 1,000 Islands Historical Society have managed to save thousands of documents and other precious artifacts from an era when tea was the beverage king. They are sorting, cataloguing and preserving everything they were able to save from the buildings at Darlingside prior to their sale to outside forces. The artifacts shown here are a glimpse into what is hoped to be an organized collection that will give a true look into the history of local business and politics through the workings of a single successful pioneer family. Prince Street, County Rd 3 just north of the Fairgrounds – the TLTI Town Hall. A petition to help stop the demolition is also available for signing at https://www.change.org/p/mayor-and-council-leeds-and-the-thousand-islands-save-darlingside?recruiter=177207169&utm_campaign=mailto_link&utm_medium=email&utm_source=share_petition. This entry was posted in Announcements, History, News and tagged Darlingside, Darlingside store, demolition, TLTI by llpayette. Bookmark the permalink.